A boat a palm tree and their reflexions in the backwaters near Alleppey below a colorful sunrise sky. 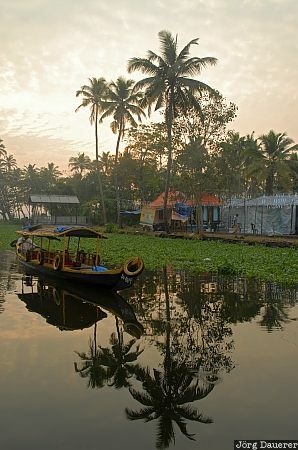 Alleppey is in the western part of Kerala in southern India. This photo was taken in the morning of a sunny day in February of 2011. This photo was taken with a digital camera.